We have here a very beautiful Windows 10 theme that will make you want to sing: "My beautiful tree, king of the forests, that I love your verduuuuureuuuuh !" This completely free theme includes about ten wallpapers (17 to be precise) but also sounds that fit perfectly with this period. The theme is installed with a simple double-click. It is also possible to customize it by going to the Windows settings and more precisely to Settings > Customization > Themes. Note that this theme "Christmas trees" also changes the sounds of the system. 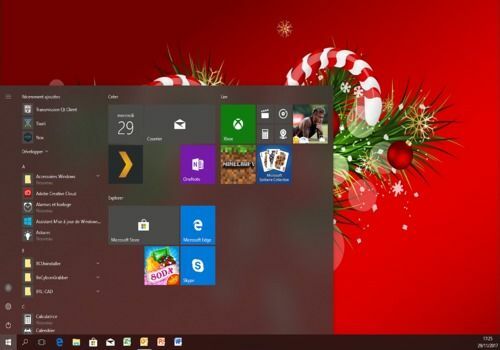 A Windows 10 theme with pets wearing their Christmas caps. Set your computer to the 2018 colors with this Windows 10 theme that can be installed with a double-click. If you have to avoid eating yellow snow, you can easily install this application that displays flakes of different sizes and colors on your computer screen. Give the old programs the look of Windows XP with just one XML file. It only takes a few seconds and is reversible. Free of charge.